Image courtesy Portland Center Stage. At Portland Center Stage, during a positioning-focused tech rehearsal for its upcoming Wild and Reckless theater production, Blitzen Trapper guitarist Erik Menteer starts gyrating his hips. His whammy bar squeaks as it dangles and bounces. 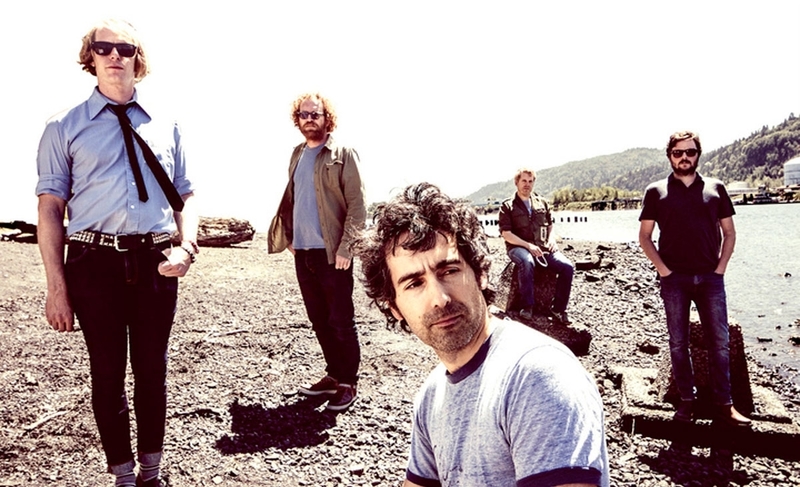 During any of Blitzen Trapper’s live concerts, the moment would have passed unnoticed—just typical rock-‘n’-roll antics. But here, it was a collision of worlds. “Is there a way to silence that?” asks a voice over the sound system. For the band, Wild and Reckless: A New Concert Event With Blitzen Trapper, is at once a step into unknown territory and a return to familiar ground. The play has the band learning the language of theater, but its key themes and imagery are drawn from the Portland of old and provide a commentary on modern American society. The play features classic Blitzen Trapper tunes like “Black River Killer,” along with new material. Earley says the production—co-directed by Rose Riordan and Liam Kaas-Lentz and featuring professional actors Laura Carbonell and Leif Norby—bridges a gap between “low” and “high” art forms. Promotional materials bill the play as a “futuristic vision of Portland’s past.” Earley says the look of the play was inspired by sci-fi horror films of the ’80s, and Blade Runner specifically. The PCS creative team’s video-based set design displays a simulacrum of colorful graffiti and photos, including the underside of the Hawthorne Bridge. Beloved spots like Satyricon and Chopsticks are also part of the play. The story explores addiction and homelessness, and draws from Earley’s own experience with homelessness two decades ago. There’s a drug, called Lightning Dust, which seems inspired by black tar heroin. And there’s a girl, simply called “the Girl” and played by Carbonell, whose relationship with Earley’s character he describes as “the nonfiction part” of the story. A set-design element called the Reaper features 1980s-era rusted street lights, broken glass and duct tape. When the Girl does Lightning Dust, she’s scarred by lightning that travels through the Reaper. It’s all meant to suggest a nation gone awry. Read the full story at Willamette Week.